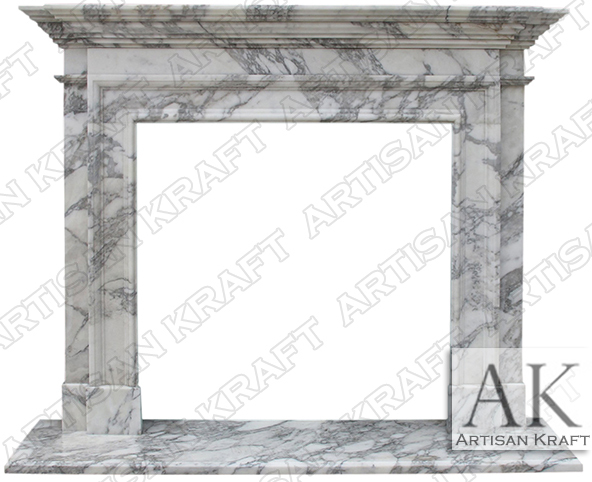 The Traditional II mantel with a design upgrade to Italian Arabesco marble. Italian Arabescato marble has rich veining as it defining feature. The veining is different than that of a Carrera marble. This is a transitional design that fit in both a traditional and a modern setting. As with most fireplaces made from marble we do recommend a polished finish. Here it can be seen in a polished finish. Smooth edges and intricate lines give a modern flair. Available to ship in 1-3+ weeks. A traditional mantel that fit perfectly in a modern setting or a transitional design. View more of our modern marble fireplaces. If you are revamping your contemporary styled home or property adding a modern fireplace mantel may be the selection you are looking for. A stylish fireplace mantel will not only enhance the appearance of the space but will also add function. Our modern styles fireplace mantels include options with straight clean lines as well as soft curves with an overarching simple and non-busy appearance. Our natural stone stock options include a wide collection of traditional 2 modern fireplace mantels. The use of high quality materials and artistic craftsmanship is guaranteed to enhance the finished setting of the fireplace mantel. In addition to this, they will serve you for many decades, so this would be a long-term, or you can say lifetime investment to enjoy with family and friends. So browse the traditional 2 modern fireplace mantels we have in our collection and choose the one that suits your requirements. In case your requirements are specific, then you can share those dimensions with us, and we will provide you the best mantels according to meet your needs. If you have any questions regarding our traditional 2 modern fireplace mantel collection, or regarding your custom requirements, do not hesitate to call us to inquire about project specific demands since the best service to our customers is our commitment and we don’t leave any stone unturned to accomplish it. Our experts listen to your questions carefully and then provide the best solutions to bring your project to life.